According to our analysis USDCAD moved 40 pips on Canada Trade Balance, Canada CPI (Consumer Price Index) and US Trade Balance data on 17 April 2019. Start forex fx news trading with Haawks G4A low latency machine-readable data today, the fastest news data feed for US economic and commodity data. According to our analysis USDCAD moved 12 pips on Canada Labour Force Survey data on 5 April 2019. Start forex fx news trading with Haawks G4A low latency machine-readable data today. 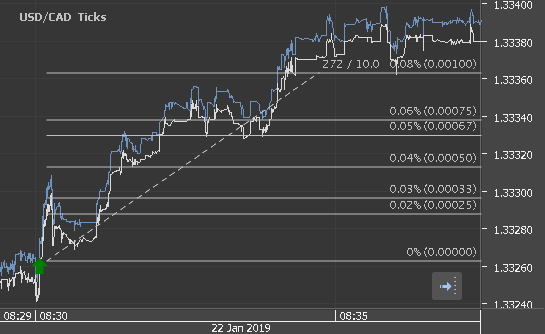 According to our analysis USDCAD moved 10 pips on Canada GDP (Gross Domestic Product) data on 29 March 2019. According to our research USDCAD moved 8 pips on Canada Retail Sales data yesterday. According to our research USDCAD moved 10 pips on Canada Wholesale Sales and Manufacturing Sales data yesterday.